I have chosen to do something to raise money for the charity helping my Mummy. I also want to help children with cancer feel happier & make them smile.I love my hair but I have decided I want other children who don’t have hair due to cancer to enjoy it too. 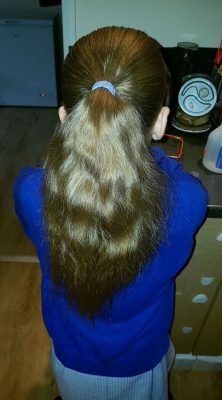 At the start of August I will be having my hair cut and the hair itself will be donated to the Little Princess Trust. It is a big deal for me to cut off my hair (so scary!) so I would like to ask for donations to encourage me to have it cut short! I hope to hit my personal target of £50! Please help me reach it! The money raised will be donated to Pancreatic Cancer Action as they have been fantastic to my family! I’ll post hair photos soon!! (The one included is from 11.07.2017 before school). This is a PayPal account set up just for fundraising money. Once all donations are received, we will make a payment direct to Pancreatic Cancer Action to make sure no fees are taken from 3rd party fundraising sites (eg.JustGiving).